The central philosophical question behind this book is this: is the nineteenth-century theory of the sovereign and unitary State still fit for purpose in the twenty-first century; and if not, can federalism provide a viable alternative model? And to answer this question, the collection then looks at federalism from the perspective of the United Kingdom. Part One tracks the historical evolution of the “British” Union and explores the various expressions of federalism that emerged between the eighteenth and twentieth centuries. Part Two then assesses the British experience of sovereignty-sharing with other nations in the context of international cooperation, such as the European Union, the Council of Europe, the World Trade Organisation and the United Nations. Drawing on the expertise of the foremost commentators in their field, “The United Kingdom and the Federal Idea” thus hopes to provide a timely and reflective evaluation of how constitutional authority is being re-ordered within and beyond the United Kingdom. Q2: What inspired you to take up this project? We have both long been interested in federal questions, that is questions about how to combine unity and diversity within multi-national governmental settings; and when the two of us met, we felt that our respective expertise would work well for a collection that looks at the broader historical and conceptual questions as well as the specific features of the United Kingdom. The fundamental idea was to illustrate, via the United Kingdom, that the idea of a unitary sovereign state is today increasingly a chimera and one that increasingly stands on shaky foundations which are today undermined from the inside and the outside. Since the middle of the twentieth century, we have thus seen a dramatic erosion of “political” or “real” sovereignty as a result of “globalisation”; with most states being today embedded in a global market and international organisations that impose significant external constraints on them. On the other hand, there also is a rising demand for “regionalism” in which especially multi-national states are increasingly facing demands to “diversify” and devolve powers to the regional level. In the twenty-first century, the question has thus arisen whether the nation state is simply too small for answering the big political questions and too big with regard to the smaller political questions. We wanted the contributors to address this political paradox and to consider whether, if it does indeed imply the erosion of the social premises of the nation-state, we consequently need to challenge much of the classic vocabulary of constitutional law and the unitary premises which underpin it. 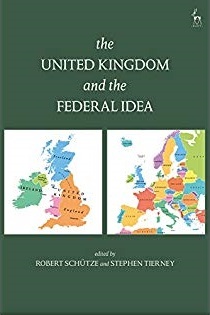 The book was not a response to Brexit; it was planned well before the referendum, but we think it is extremely relevant to current debates, raising the question of how British constitutional law has responded to supranational and subnational constitutional claims (including the Scottish independence debate), and whether a profound re-thinking about the nature of federalism is needed to understand the complexity of the deep political and constitutional entanglements that characterise our time. Q3: Whose work was influential on you throughout the course of the project? We have both been deeply inspired by writers on American and Canadian federalism and, in Robert’s case, also German and European federalism. The authors that here come to mind are: Bruce Ackerman, Laurence Tribe, Kenneth Wheare, Thomas Hueglin, Konrad Hesse, Carl Schmitt, Pierre Pescatore and Eric Stein; but we have also been inspired by conceptual historians such as Quentin Skinner, by modern UK constitutional theorists, in particular Martin Loughlin, and by those within political science who explore the rescaling of the state today, such as Michael Keating. Editing a book is always an adventure; and we were phenomenally lucky with our authors who were brilliant, understanding and patient. One of the main challenges in writing a book about the United Kingdom at the moment is that its “constitution” is under such stress due to its decision to leave the European Union. We were also conscious of editing a book at a time of change and of not chasing events. We asked authors to try to ensure that they did not focus solely upon current events but to give us a historicised and lasting reflection of the constitution over time. The book is therefore at less risk of significant changes overtaking it – even if there are, of course, strong centrifugal and centripetal forces that appear to tear the United Kingdom apart. And yet: when we read the historical chapters in the book, for example by Peter Oliver, Alvin Jackson and David Armitage, we see that many of these pressures are less novel than they may appear and that the UK has always had to adjust to deep pluralism within and beyond its borders. In terms of methodology, the book was a true pleasure to edit, as the collaboration of historians and lawyers is always fruitful. We feel that the historical contributions to the book helped us to understand and contextualise much of the domestic, European and international law analysis that follows. Q5: What do you hope to see as the book’s contribution to academic discourse and to constitutional or public law more broadly? We hoped that we could make a contribution in three main areas. One is the book’s interdisciplinarity. It brings together constitutional, European Union and international lawyers, all with their own “specific” perspectives and yet dedicated to a common theme; but also historians who engaged brilliantly with the legal issues and helped us to see these from a deeper and wider perspective. Secondly, it addresses the much under-studied issue of federalism from a United Kingdom perspective. David Marquand had famously described the British aversion to federalism as “neurotic”; and we have thus sought to revive the federal discourse in the UK. The book’s third contribution lies in offering a range of theoretical themes which we hope will inform the debate upon the future of the British constitution. Our fundamental argument here is to emphasise how the “internal” and the “external” dimensions of the UK’s approach to pluralism are in fact deeply interconnected and thus demand a sophisticated and “holistic” constitutional discourse in the twenty-first century. More books on federalism and comparative constitutional law! Robert has recently co-edited the Cambridge Companion to Comparative Constitutional Law – which is to come out in September 2019; and he is working on a range of ongoing “federal” projects, including – in the future – the Oxford Handbook on Comparative Federalism. Stephen recently gave a Current Legal Problems lecture at UCL which should shortly be published as ‘The Territorial Constitution and Brexit’ and, with Martin Loughlin, published ‘The Shibboleth of Sovereignty’ in the Modern Law Review in January; he is also working on a monograph: Federalism: A Constitutional Idea, which he hopes to complete next year.